The oxford ragwort is so-called because it originated as an escape from the Botanic garden at Oxford where it was in cultivation from at least as early as 1690. Its spread in Northern Ireland dates from after about 1964 (the date of the earliest Northern Ireland record) and it rapidly became very abundant after about 1980 on motorway verges in north Belfast. 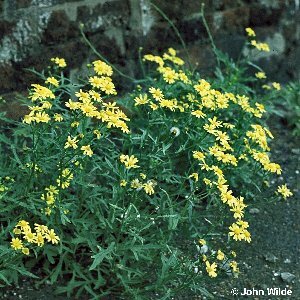 At present it is a very common member of the weed flora of waste ground and road verges in the Belfast district. It is also spreading into other parts of Northern Ireland. The plant was introduced into Oxford Botanic Garden (and from there into the rest of the British Isles) from Mount Etna in Sicily. Recent investigations have proved that Oxford ragwort is not a true species but is actually a hybrid which occurs naturally on the Etna slopes and which is derived from two other Senecio species which grow there. This account quotes the recent work of R.J. Abbott and collaborators published in the BSBI's journal Watsonia. Abbott, R.J. , James, J.K. , Irwin, J.A. & Comes, H.P. Hybrid origin of the Oxford Ragwort, Senecio squalidus L. Watsonia 23 123 - 138 (2000). All names: Senecio squalidus L.